Marking his retirement, Christian writer and preacher R.T. Kendall presents this revealing personal account of his eventful and often turbulent 25-year tenure as Minister of Westminister Chapel, one of London's most historic Evengelical churches. He talks frankly about the blessings and disappointments he has experienced in that time, including his relationship with Dr Martyn Lloyd-Jones, and the pressures of succeeding such a famous name; and some of the controversial changes he introduced, which in one instance brought him into such conflict with some members of the church that he was almost forced to leave the Chapel. - Publisher In Pursuit of His Glory is a revealing and moving personal account of R T Kendall's eventful and often turbulent 25-year tenure as Minister of Westminster Chapel, one of London's most historic Evangelical churches. He talks frankly about both the blessings and disappointments he has experienced in that time, including his touching relationship with Dr Martyn Lloyd-Jones, and the pressures of succeeeding such a famous name; and some of the controversial changes he introduced, which in one instance brought him into such conflict with some members of the church that RT was almost forced to leave the Chapel. This paperback edition includes 'The Day the World Changed', the text of two sermons RT gave in response to the events of September 11th. An engaging and page-turning read, rooted in solid theological teaching. 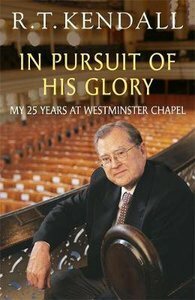 About "In Pursuit of His Glory"
In Pursuit of His Glory is a revealing and moving personal account of R T Kendall's eventful and often turbulent 25-year tenure as Minister of Westminster Chapel, one of London's most historic Evangelical churches. He talks frankly about both the blessings and disappointments he has experienced in that time, including his touching relationship with Dr Martyn Lloyd-Jones, and the pressures of succeeeding such a famous name; and some of the controversial changes he introduced, which in one instance brought him into such conflict with some members of the church that RT was almost forced to leave the Chapel. This paperback edition includes 'The Day the World Changed', the text of two sermons RT gave in response to the events of September 11th. An engaging and page-turning read, rooted in solid theological teaching. Customer Reviews For "In Pursuit of His Glory"
A Heart-warming and Insightful Autobiography! Kendall's book, which won the Best Christian Autobiography 2003 award, is divided into four parts. In Part 1, the author shares about his early years at Westminster Chapel and also his relationship with Dr. Martyn Lloyd-Jones. In Part 2 which he entitled "Taking Risks," Kendall proceeds to describe how he got to know and invite to the Chapel people like Arthur Blessit, Paul Cain and Rodney Howard-Browne - people who brought not only blessings but also controversies to the Chapel. In "Part 3: A Preacher's Dream," Kendall talks about his preaching and sermon preparation. He also gives the reader a glimpse of a happy church and stories of some sweet moments. "Part 4: What I Have Taught" reveals various theological and practical principles which have informed and undergirded Kendall's ministry. Finally, in "Part 5: Some Final Reflections," Kendall shares some lessons he has learned over the years ministering in the Chapel. If one is a lay Christian reading this book, he is sure to understand the heart of a pastor and the challenges he has to face in the ministry. If the reader is a pastor himself, he will certainly find much encouragement and comfort to know that he is not alone in having to face various issues and challenges that he encounters in pastoral ministry. This autobiography is a good read and highly recommended.